While sometimes overlooked by contractors building warehouses and similar structures, vinyl roll-up doors are an excellent option for your dock. They offer benefits well beyond traditional metal doors, with cost savings both up-front and ongoing. Roll-up doors can potentially even make your warehouse easier and more pleasant to work in, something your workforce is sure to appreciate. The choice of door on your dock might seem like a small thing, but the right choice can bring some big benefits. Vinyl mesh is significantly cheaper to produce than the aluminum or steel typically found on warehouse dock doors but sacrifices very little in terms of strength. Because the mesh is flexible, it can stand up to even heavy impacts – potentially even impacts that would harm a more solid door, or the object hitting it. The mesh simply flexes, then snaps back into place when the impacting object is removed. If impact occurs and does damage the mesh, there is no need to replace the entire door. Goff’s vinyl roll-up doors are built so that each section can be easily replaced if damaged. Anyone who’s worked in a warehouse knows how stuffy and sweltering they can get. A vinyl roll-up door helps alleviate this! Because it’s based on a mesh, it allows airflow even with the door closed. However, the mesh is fine enough that it prevents insects, dust, or other contaminants from getting inside. This gives you a best-of-both-worlds solution: your dock door remains closed when not in use, but without shutting off airflow. Another big benefit to vinyl roll-up doors is that they absorb far less heat than metal alternatives. This will also help reduce temperatures inside the warehouse, as well as reducing strain on any air conditioning systems you might use. That translates into further ongoing cost savings. 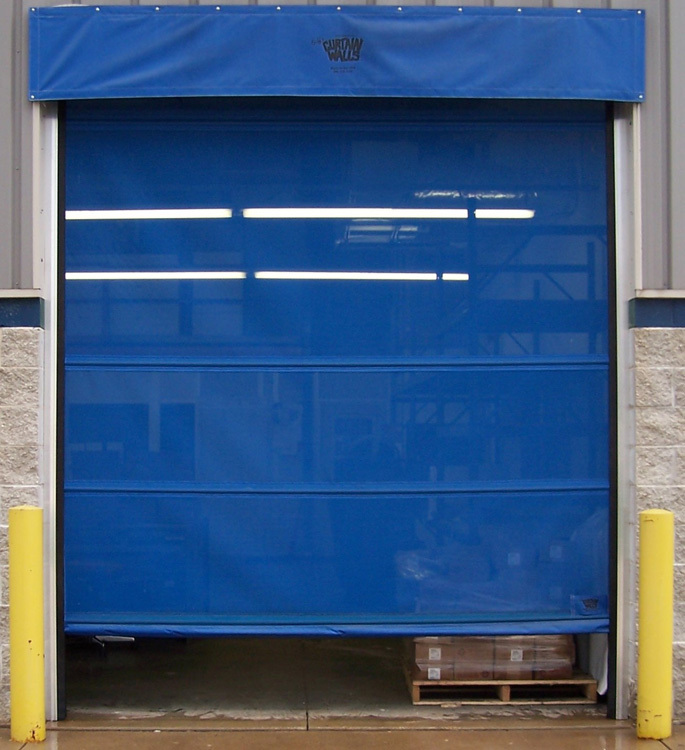 Vinyl roll-up doors are much easier to open and close than any metal alternatives, meaning your dock workers can be more effective. There are motorized options for rolling up the door, or you can simply have people do it by hand. Since the door is so naturally lightweight, it’s easy to work with either way. Since 1987, Goff’s Curtain Walls has offered innovative new ideas in space management, with flexible easily-deployed partitions. From warehouse dock doors to sound control screens, Goff’s Curtain Walls has solutions to meet your partitioning challenges. Contact us today!